Panelists, from left, Sergio Contreras, president of the Rio Grande Valley Partnership, Dr. Carlos Cardenas, president of the Texas Medical Association and Anne Dunkelberg, associate director of the Center of Public Policy Priorities, speak during the Futuro RGV healthcare symposium Tuesday in McAllen. 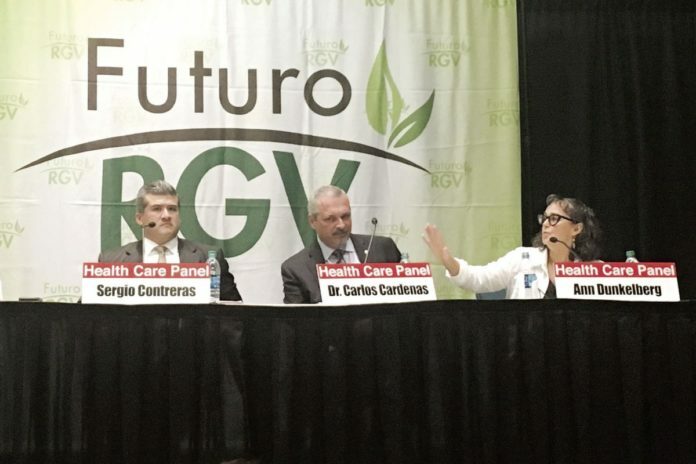 McALLEN — Health insurance is not the key to a healthier life — this was a point panelists often emphasized during Tuesday’s healthcare symposium hosted by Futuro RGV. The group is dedicated to informing the community on quality-of-life issues. Education about diabetes prevention and treatment is considered to be among the most significant need for the region, according to Dr. Joseph McCormick, regional dean of UT Health School of Public Health in Brownsville. McCormick, the keynote speaker for the event, noted the high level of diabetes and pre-diabetes in the Rio Grande Valley. His program conducted studies with randomly selected families across the region to collect health data. They found that 27.6 percent of adults have diabetes — three times the national rate — while 32 percent have pre-diabetes, which means a person has abnormal levels of glucose. But health is mainly determined by social factors, McCormick argued. He argued that by educating themselves on how to live a healthy lifestyle, people can avoid diseases that are linked to being overweight or obesity, such as diabetes, heart disease and liver disease. Carlos Cardenas, president of the Texas Medical Association, agreed that being informed on what he called healthcare literacy was most important. Gonzalez said a lot of issues also stemmed from the fact that the Valley is a low-income region. “You can’t combat disease if you can’t increase the income of the community, so we’re looking at increasing jobs — good jobs,” he said. For impoverished areas like colonias, distance from clinics and lack of transportation are significant issues, according to Ann Cass, executive director for Proyecto Azteca. Cass said the lack of sidewalks, or other recreational areas, leads to high obesity rates in children who grow up there. Their lack of transportation, on the other hand, impedes them from going to clinics when they need care. Eddie Olivarez, the chief administrative officer for the Hidalgo County Health Department, agreed about the importance of transportation, but to him one of the most important things was the continuation of the 1115 Waiver Program. The program, offered through the Centers for Medicare and Medicaid Services, has funded $602 million worth of services, education and residency programs across the region through the UTRGV Medical School, Olivarez said. The 1115 Wavier funds allows states like Texas that opted not to expand Medicaid under the Affordable Care Act to nonetheless receive federal funds for programs that serve low-income populations. The funds, however, are only temporary. Much of the national debate in recent months has focused on the repeal and replacement of the Affordable Care Act, or Obamacare, by Republican legislators. However, prominent Democratic legislators have recently come out in support of a single-payer healthcare plan. This was among the topics panelists covered at Tuesday’s symposium. Single-payer wouldn’t solve all problems, argued Anne Dunkelberg, associate director of the Center of Public Policy Priorities in Austin, but financial access to health care is a powerful piece of the puzzle.